This left facing, full length standing profile portrait shows Edward Gostwyck Cory, aged 40, in street attire. It was painted in England, during Cory’s five years residency there between 1837 and 1842. He wears a knee-length black cloth frock coat with a dark [blue] velvet collar, over a black waistcoat and a white shirt with a high, standing collar wrapped with a black neckcloth, above narrow-fitting, light-coloured [striped] trousers strapped under his boots. In his right hand he holds a large black top hat and cane, with a pair of light-coloured gloves in his left hand. His receding reddish-brown hair is cut short and brushed forward, and he wears mutton chop side whiskers. 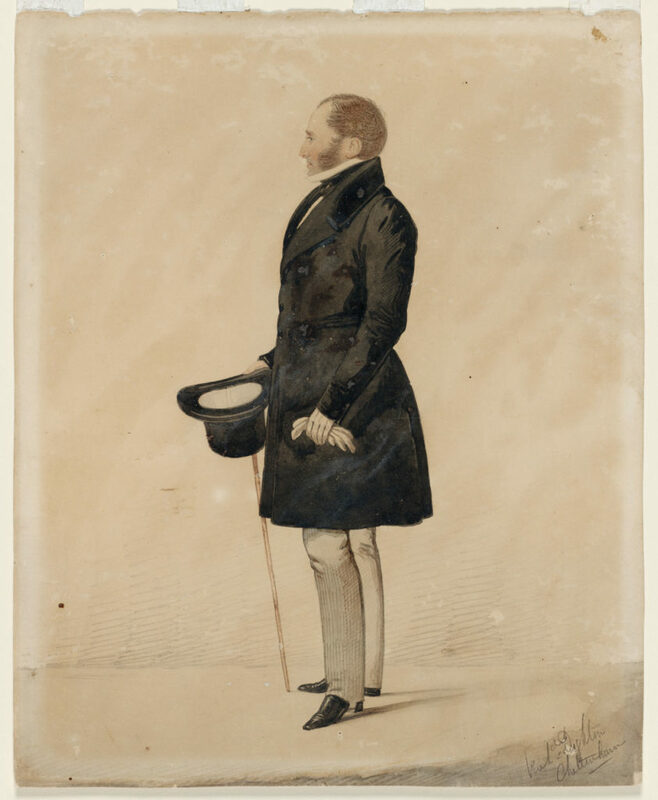 Known as the ‘King of Paterson’, Edward Gostwyck Cory (1797-1873), arrived at Sydney on the Allies in 1823, with his wife Francis, née Johnson. Settling on the Gostwyck estate, on the Paterson River near Maitland, NSW, following the sale of his New England properties Cory returned to England for a 5 year period during which time it is probable that this portrait – one of Dighton’s many profiles studies – was made. Richard Dighton (1795-1880 ) was an English artist of the Regency period. Best known for his many satirical profile portraits of contemporary London celebrities and characters, from 1828 he settled at Cheltenham, near Bristol, where he concentrated initially on watercolour portraits, and on lithographic portraits after 1835.